Pay Per Click Sites are really important for websites owner as well as for blogger, there are only one important reason is these Pay Per Click in short PPC advertisement websites let you earn money from your sites (Blog or Website). In this blog post I will share with you Top 5 Pay Per Click Websites, which will really make you lot of revenues from your sites. Well, there are many websites in the internet those offers site owner to place ads and site owner get paid when someone their visitors click on their ads. 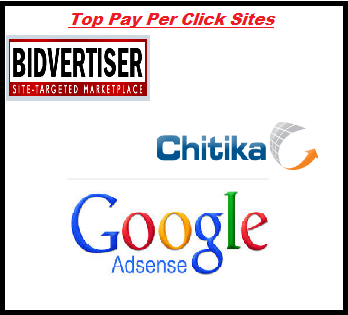 Google Adsense is one of the best PPC website in the world, because of their high pay rate per click, as I have seen till now it's maximum paid amount per click in about 23$ per click. My recommendation- if you wanna really make money from your blog then this is the best. Let's talk about Google Adsesne ROI (Return of Investment), this is for advertisers those want to advertise their product or service then Google Adsense is the best to try. But first try if it works for you then go for big one. I have used this network on my blog, I got paid many times from this advertisement network, so I will also recommend you to use this network for you blog. But use their 250*250 spot to earn more revenue from your blog. Bidvertiser specially having one unique feature that is their approval process, their approval process is quiet fast. If you will apply today then you will get approval today only, that is good for any one to get start. Minimum balance to withdraw money is only $10 and that is amazing for small publishers. Chitika is also a good advertising network, it's unique features are more Click Through Rate(CTR) as well as approval process. If your blog is getting traffic from USA, UK then if you will use Chitika it would be great for more revenue. If you have used any Pay Per Click sites then I got question for you, have you ever seen more than 5% CTR, means 5 people click on ads out of 100 visitors. But in the case of Chitika I have seen even 17% CTR, that is the great feature of Chitika, if you have traffic then they will make you lot of dollars. That's true, because I made from Chitika. Okay, after know the need of this, I have written an amazing article for all small publishers under different title that is top CPM networks for small publishers in 2016 and this article is going to give you right direction to monetize your blog and let you earn money online. Well, there are many Pay Per Click sites in the internet, but all of them are not like these three, if you want to really make more then these three are the best at least for advertisement network, other than these you can try affiliate marketing to earn more revenue from your blog. Is there any Pay Per Click Sites for Better Revenue From Blog? These all are just awesome PPC networks.